Not just simple adapters! These adapters each feature their own blow resistance and playing characteristics. You will be able to customize the feel and blow resistance to center the notes and optimize articulation. Yes, each adapter offers a different blow resistance! This has never been heard of in the industry! - Players can use different adapters for different musical situations. For example, if you need to play the extreme upper register, use a tighter adapter for compression and a characteristic sound. But, if you need to play bigger above an orchestra, use a slightly more open adapter. - If you can not play a very small piccolo cup, yet you must perform extreme upper register work, a tighter blowing adapter can be used to achieve compression with a larger piccolo trumpet cup! 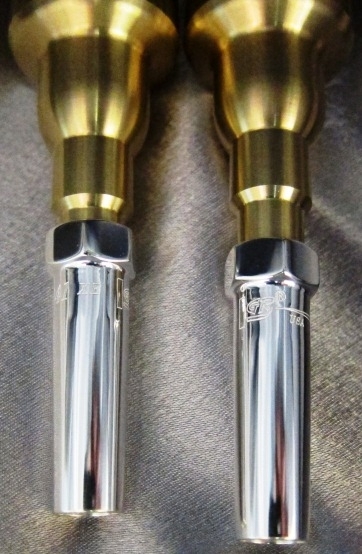 - GR Adapters will give you the ability to adjust for the Bb and A side of the piccolo trumpet. 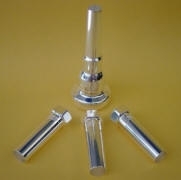 - One GR Piccolo Trumpet Mouthpiece quickly becomes three when used in conjunction with the GR Adapter Set!